Samuel Adegboyega University in Ogwa, Edo has conferred an honorary doctorate degree in Public Administration on Gov. Rauf Aregbesola of Osun state. 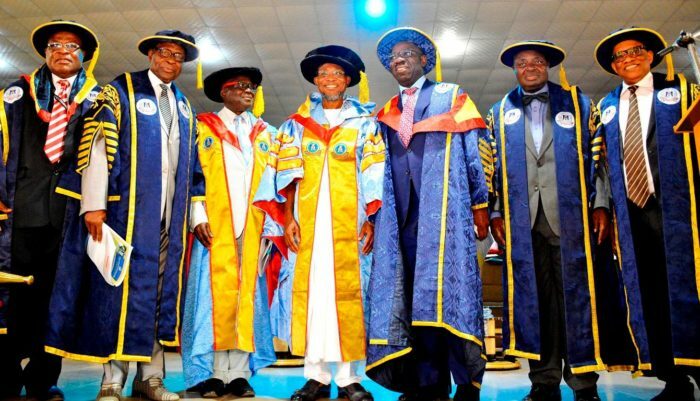 The Vice-Chancellor of the University, Prof. Ben Aigbokhan at a special convocation held on Saturday extolled the qualities of Aregbesola, which he said stood him out for the honorary degree. Aigbokhan said the good leadership qualities of the governor had placed his state among the top five with lowest unemployment rate in the country. “Osun is also second in human capital development in Nigeria,’’ he said. He assured that the university would continue to do its best in promoting healthy tradition, within available resources. The vice-chancellor said the university was committed to producing globally relevant, competitive and entrepreneurship-minded graduates. In his remarks, Aregbesola thanked the university for the honour and advised government at all levels to commit resources to funding education even if it would require borrowing. Also speaking, Gov. Godwin Obaseki of Edo urged Aregbesola to continue his humanitarian work, adding that the award symbolised unity in Nigeria, given that the recipient is a Muslim..